Ugh I held out against more magnetics for a while. If you follow me on IG you may have seen this one - which was gorgeous! Truthfully when I use the US ones it just makes me crave the Masura ones so much more horribly. Their color range is stunning and frankly there are more polishes from their line than any other. Not saying that I wouldn't also kill for the Golden Eyes from Dance Legend, but basically nothing trumps Masura. Nonetheless I had to had to do this. I was playing around after one of my prior mani's popped off and then I created this magic. Suddenly I had to do a full blown mani and of course I had to share ;) Let me know if you'd like to see more magnetic mani's in the future or the different techniques too! The other thing about Masura magnetics I'm realizing compared to the current magnetics I own is just how much richer their polishes are in terms of color depth. 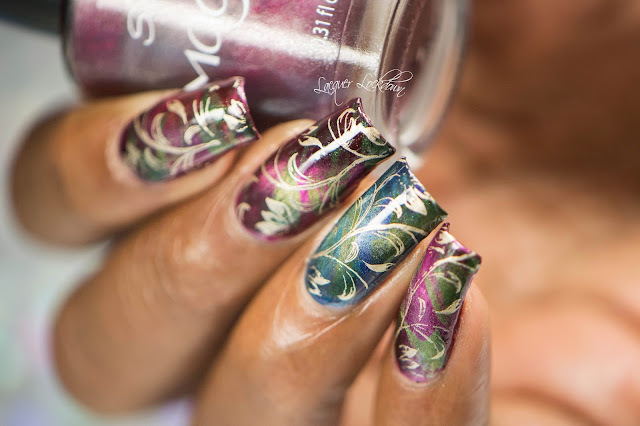 I can see it when the polishes shift in the videos on their channel and other IGers I'm following (Russians of course). These Sally Hansens are though in their own right beautiful and I was able to get a similar effect, but I wanted them to be a tiny bit deeper on the darker shift. 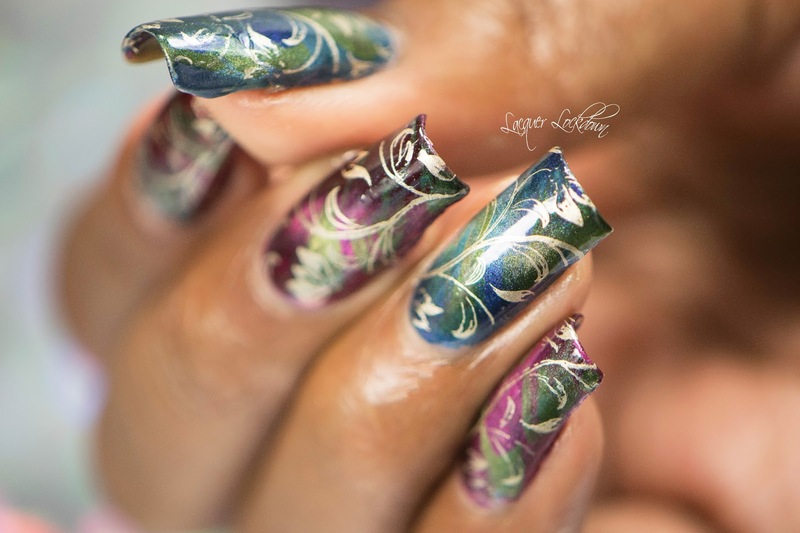 I don't know how to explain that well, but as the magnet pulls the lighter colored particles toward it you are left with a "darker field" of the original polish color. That dark field appears richer in the Masura's from what I've seen. I got my Sally Hansen magnetic polishes here for pretty cheap. 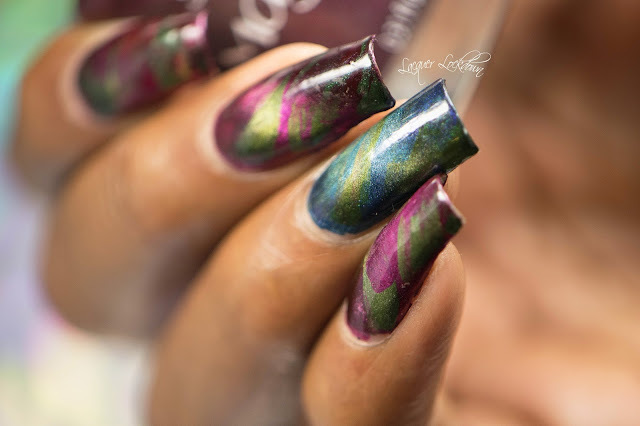 A few things about magnetic mani's I'm learning. First, you can create these mani's 3 ways either with dry brush strokes or in solid squishy manis with directionality. The third I'm uncertain of because I honestly don't have the toppers to try that technique with but yeah there are at least 3 ways I've seen. This is a directionality type one. If you watch my tutorial you'll see what I mean. 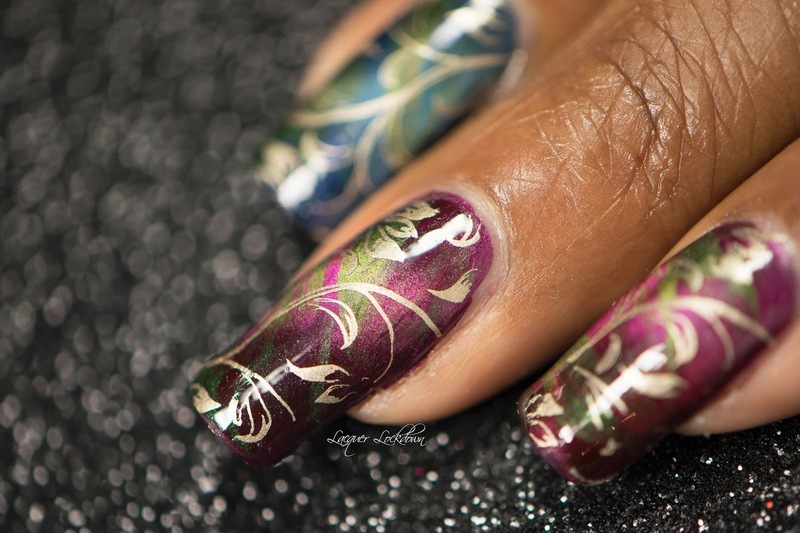 The soft gold of this Messy Mansion stamping polish married so well with these 3 colors its incredible! 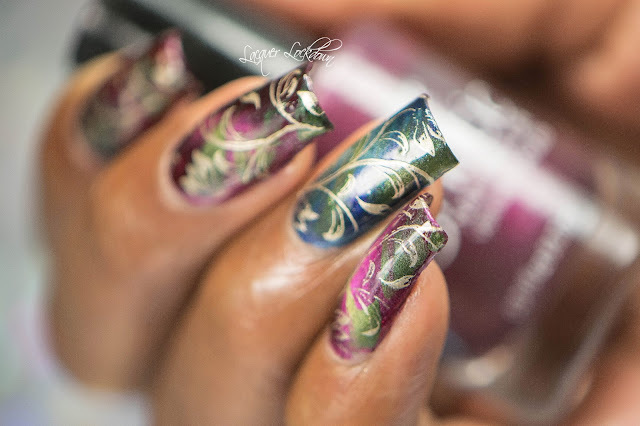 I've had my MM stamping polishes since I bought them during her December sale and never really got a chance to review them or test them out myself. Don't worry its coming but basically buy them. They are VERY opaque and IMO very close to my favorites. 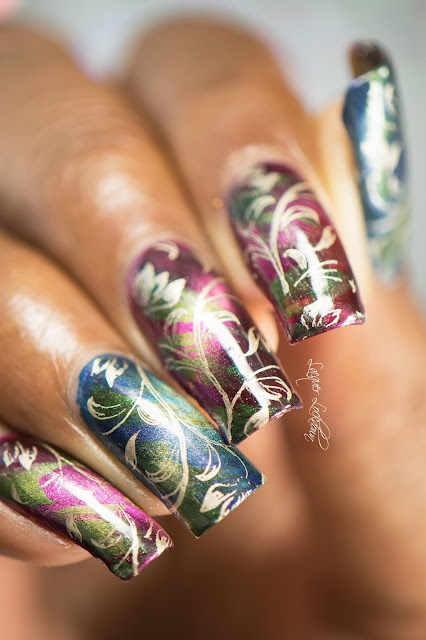 Combined with the soft gold of the polish I purposely chose one of the most delicate patterns I had in my stash for this mani because I did not want to obscure the magnetic shift. 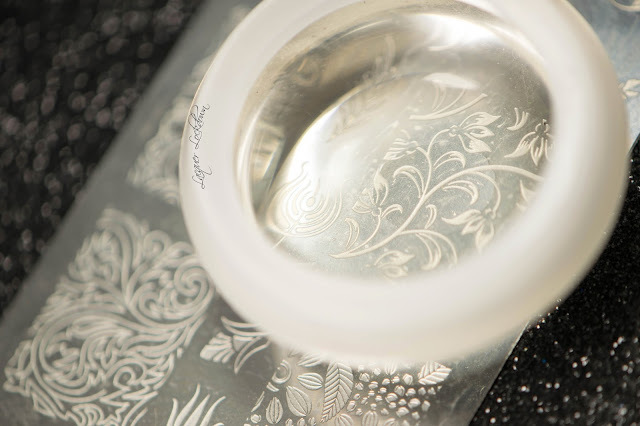 I also used my Jumbo UberChic Beauty Clear Stamper here with the correct holder and it was purrfect! Speaking of the magnetic shift, I did these with a neodymium magnet that I purchased for dirt cheap from Ebay. I pretty much have zero doubt now that these are the same magnets that Masura sells as their Masura magnet. Of course I don't have it or the polishes so I can be 100% on it but they are the same size and shape and I am getting the exact same effect with different polishes. These magnets are NOT however the same as the crappy cheap magnets on top most bottles of magnetic polishes. I also have another tool that can do this, but I haven't tested it yet! 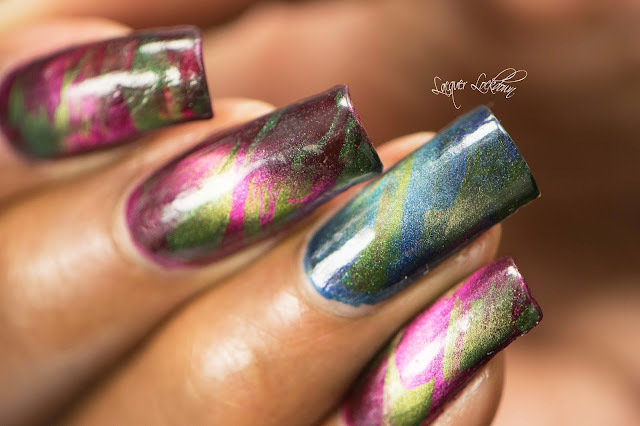 Anyway I'm glad I finally actually did get around to showing you all how to create these magnetic mani's. Despite how seemingly easy I made this look when I was trying to master the brush technique I nearly lost my mind. Learning how to place the polishes on my nail alone was incredibly frustrating and I must have failed 16 times before I finally got what I wanted. I'm still not 100% comfy with these types of mani's, but practice makes perfect. I think you will find if you try to create what I did it will also take some practice, but don't get frustrated and hopefully I will have eased that process for you with the video. 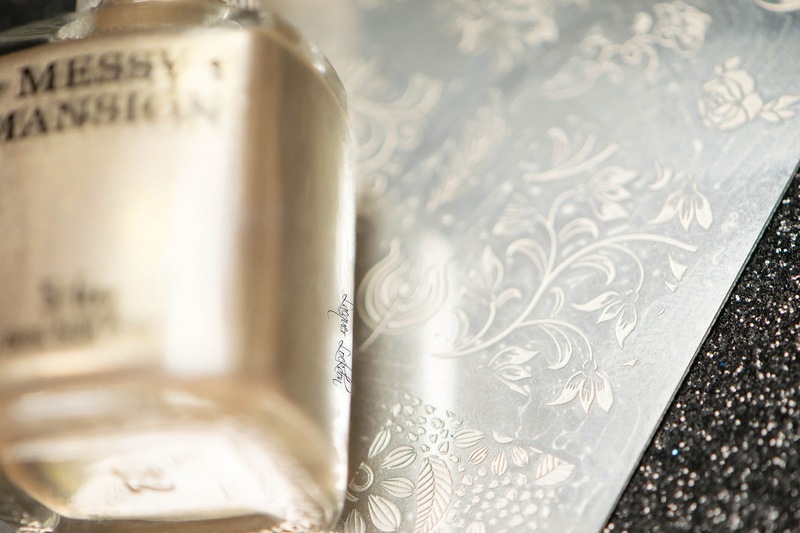 You can find the UberChic Jumbo Stamper at UberChic Beauty. The DIY holder can be found here. Thanks for reading and I'll see you next post! This post contains items purchased by me and also those sent for my honest review. For more information see my Disclosures Policy.